Google added a plastic desert sculpture of a frozen yogurt outside of their Android building today (here’s Eclair, the last version), indicating the imminent arrival of the next version of the Android operating system, Android 2.2, AKA Froyo. In addition to full Flash support and a whopper of a speed improvement, we’ve just confirmed something that’s even more stunning. Froyo will have built in USB tethering so you can share your data connection with your laptop, something Apple and AT&T still haven’t managed to allow in the U.S. And even better: you can turn your Android phone into a portable wifi hotspot as well. 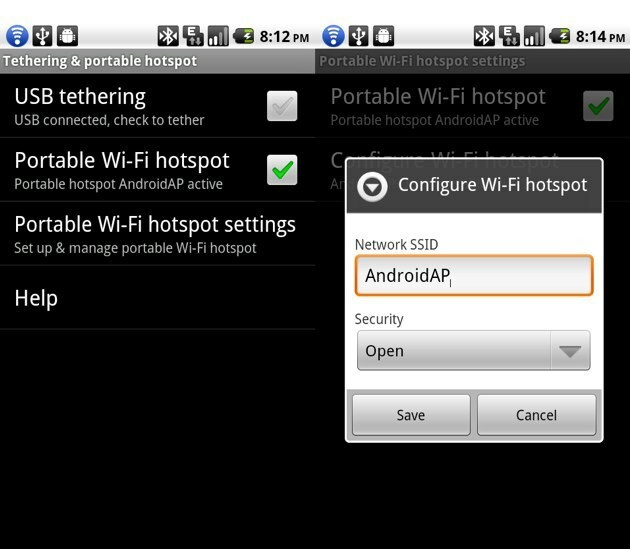 You can see the tethering and wifi hotspot features in the screenshots above. One thing that isn’t clear from the information we’ve received is whether carriers can turn this feature off, or even charge for it, unless they break away from the standard Android build. This is, of course, terrific news for Android users. I still believe Android phones, paired with Google Voice, are the closest thing to mobile nirvana to date. With tethering and wifi hotspot features, Apple and others have some serious catching up to do. Expect Froyo to officially launch no later that the Google I/O event next week. And we’ll have Vic Gundotra, Google’s VP of Engineering, on stage at TechCrunch Disrupt the week after next.